Farrier, Wayne Blevins and Veterinarians, Chris Voss DVM and Angie Stamm DVM of Slate Creek Veterinary Clinic, were presented with a 5 year-old Morgan gelding, named Rowdy, with severe abscessing and acute laminitis in August 2003. The owner, Chris Crowe of Shingle Springs, Ca. began feeding two ounces of The Perfect Horse® a day. The two sets of radiographs show the September condition on the left and the December condition, just three months later, to the right. Two ounces The Perfect Horse® was fed daily throughout the Case study. Note the change in bone alignment and soft tissue growth (two times the amount of soft tissue!). 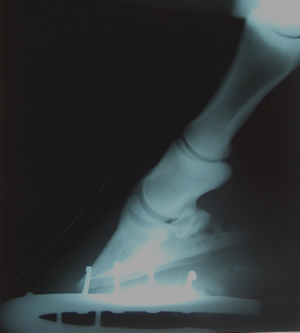 On September 5, 2003, radiographs were taken and it was determined that the coffin bone had descended and rotated on both front hooves. The heels were removed on the affected front hooves, to produce a low palmar angle and rocker toed shoes applied. The horse appeared sound at a walk although responded with pain when hoof testers were administered to the sole. 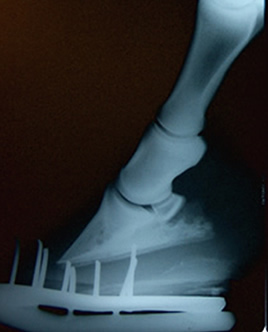 In October 17, 2003, the shoes were pulled, new distal sole regeneration was evidenced by clearness of tissue in the toe and quarters of the hoof. This allowed the Farrier to apply a more extreme Rocker toe shoe, and frog support pads. The hoof testers were applied with a small pain response, indicating good progress. On December 1, 2003, the shoes were pulled, an abundance of new distal sole regeneration was evidenced, (see additional photos below). 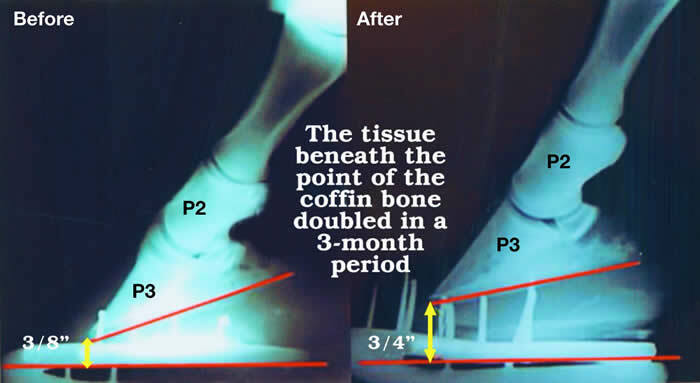 An even greater angle of the Rocker toe shoe was allowed by the build-up of new sole growth, moving the break over to the widest point of the hoof. New radiographs were taken that showed good alignment of the P2 and P3 as well as significant increase of sole depth, beneath the point of the coffin bone. 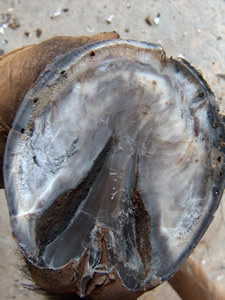 Cell regeneration initially works where the hoof is most damaged. In this case, it is the right front toe where we see the clear keratine replacing what used to be a keratoma.